Renowned baker Richard Bertinet brings bread right up to date with his hallmark straightforward approach to achieving the perfect crumb. Richard shares his expertise through every step of the baking process, including the different techniques of fermenting, mixing and working - never 'kneading' - the dough. 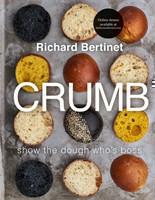 With stunning step-by-step photography, simple advice and helpful techniques throughout, Crumb will inspire and fill you, whatever your experience, with the confidence to 'show the dough who's boss'.